GroupWriter is one of the most popular features in ReportComplete. It allows you to add a comment or generic block of text to a selected set of students. 1. Click the GroupWriter icon. 2. The top half of the screen will change to GroupWriter mode. 3. Clicking a student will either select or deselect them. The green students are selected, the blue student is the person you should write about in group writer, eg keep the forename and gender specific to them. 4. Once you have finished writing just click the bottom 'Add' button and the text will be copied into all the students selected in the pupil list. The text copied for each student will have their correct name and gender. GroupWriter will then be exited. 5. You can create saved groups of students by clicking the top add button. 6. You will see the new group button at the top of GroupWriter. 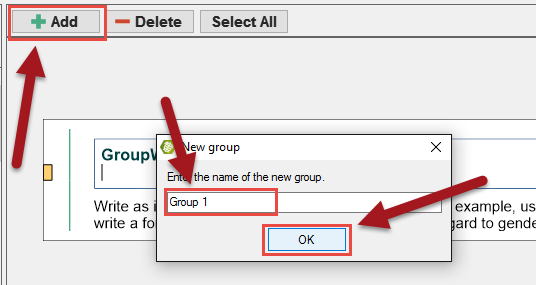 Any students selected whilst that button is highlighted will automatically be saved to that group, if you deselect a student then they will be removed from that group. If you want to delete the saved group then just click the 'Delete' button. This page was last modified on 20 March 2016, at 23:21.